It’s time for our eat-down since we are leaving for home on Friday. Looking around the refrigerator I see that we have leftover spaghetti sauce, probably not even a half of a cup and certainly not enough to make a meal. So I use this “spaghetti sauce starter”, add a can of diced tomatoes, a little tomato paste, onions, garlic, and mushrooms. Because I want a small portion of penne, I also cook up some zucchini with onions and garlic. So a reasonable pasta dinner which was still filling. 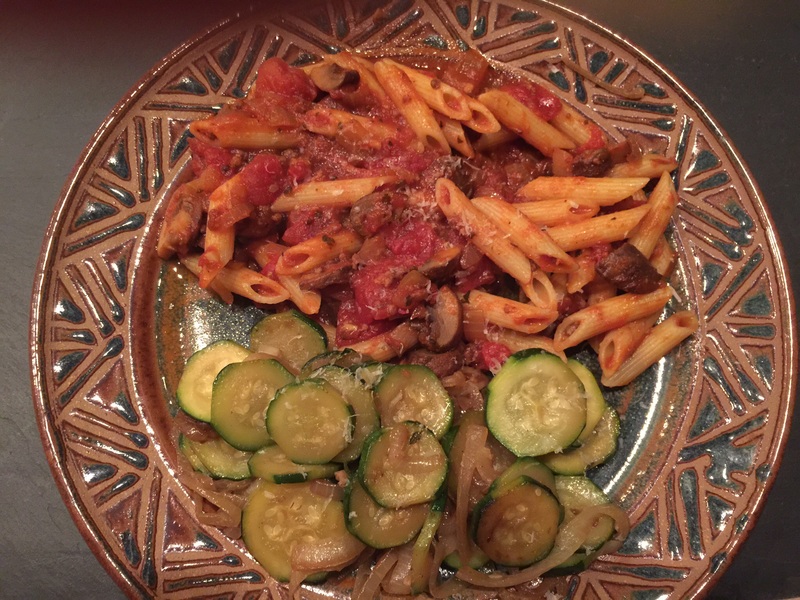 This entry was posted in Vegan, Vegetarian and tagged mushrooms, penne, Vegan, vegetarian, zucchini. Bookmark the permalink.